FamilySearch, one of the most popular genealogy websites, released an end of the year review about the things they accomplished in 2016. You might already be benefiting from some of those things. Here is a quick look at some of the highlights from the FamilySearch 2016 end of the year summary. In 2016, FamilySearch added 103 family history centers around the word. That makes 4,960 centers in 129 countries – 3,108 located outside the United States. There could be a family history center near you. FamilySearch added 125 new historical collections in 2016. That brings their total to 2,174. They added 59.5 million online digitized record images, making 1.22 billion. More than 5.57 billion searchable names are available in four billion searchable historical documents that are published on FamilySearch. FamilySearch was one of the hosts of RootsTech 2016, the largest family history and technology conference in the world. The 2016 RootsTech attracted a record 375,000 attendees in person, online, and through local events throughout the year. Maybe you were among those people. Or, you might be attending RootsTech 2017, which FamilySearch is also one of the hosts of. 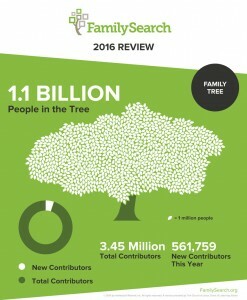 FamilySearch’s collaborative Family Tree expanded in 2016. 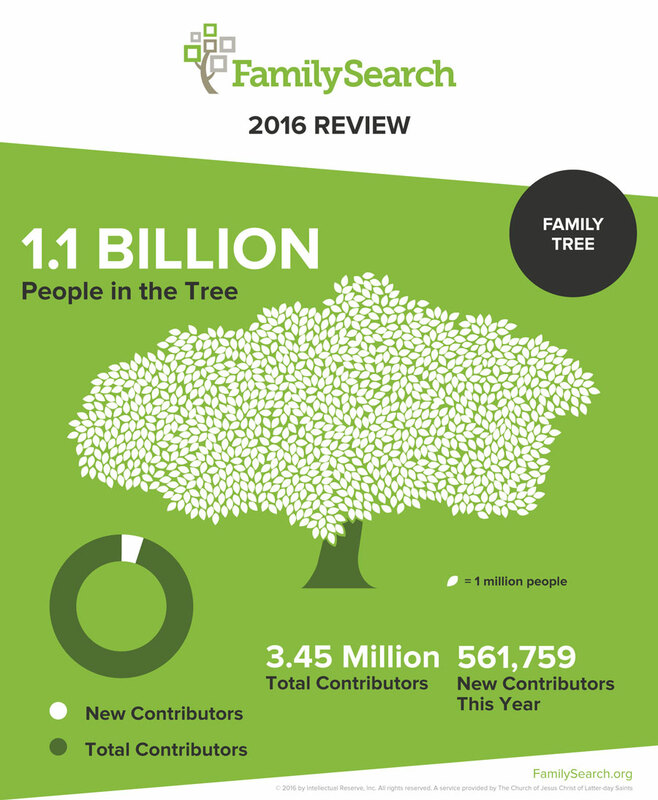 More than 561,000 new contributors added to the FamilySearch Family Tree, making a total of 3.45 million contributors. There are now a total of 1.1 billion records of individuals on FamilySearch that are linked in the FamilySearch Family Tree. The relatives you placed on your FamilySearch Family Tree in 2016 may have helped other FamilySearch users to fill in the branches of their family trees. The contributions of other people might be what helped you to add to your own family tree. In 2016, FamilySearch, along with the Smithsonian National Museum of African American History and Culture (and other organizations) finished indexing and publishing online images of the Freedmen’s Bureau records. Information about your ancestors could be in those records. Those records document the lives of freed slaves. The digitized records are searchable on DiscoverFreedmen.org as well as on FamilySearch.org and other websites. FamilySearch presented a copy of the newly completed records to the Smithsonian Museum on December 6, 2016. In 2016, FamilySearch expanded their online language training to include Italian, French, Portuguese, and Spanish, teaching English speakers with no prior foreign language experience to recognize key words and index accurately in another language without becoming fluent in that language. This enabled FamilySearch indexers to index records that were not in English.